Se trentatré anni e un terzo è lo stupefacente intervallo temporale - effettivo, non solo simbolico - tra la prima pubblicazione di Cuneiform Records (What’s the Point? di R. Stevie Moore, nel 1984) e l'ultima (il box degli Art Zoyd 44 ½: Live and Unreleased Works, poche settimane fa), una pausa di riflessione nel 2018 sarà non soltanto meritata, ma anche necessaria. Forse foriera di grandi cambiamenti. Lo scrive in prima persona Steve Feigenbaum, cercando comunque di rincuorare i sostenitori dell'etichetta (e quelli di Wayside Music): "The biggest news this week is that, due to the fact that the market for recorded music continues to dwindle while the expenses of making and releasing recorded music, especially the promotional expenses, stay the same or go up, I am forced to lay off my (excellent) promotional staff and am discontinuing releasing any new Cuneiform titles for the immediate future. Maybe you've heard this elsewhere and maybe you are hearing it now for the first time, but it's very important that all of Wayside Music's customers understand this: We are not going bankrupt; I and Simon and Lindsey are still here and running Wayside Music, which remains a viable operation. 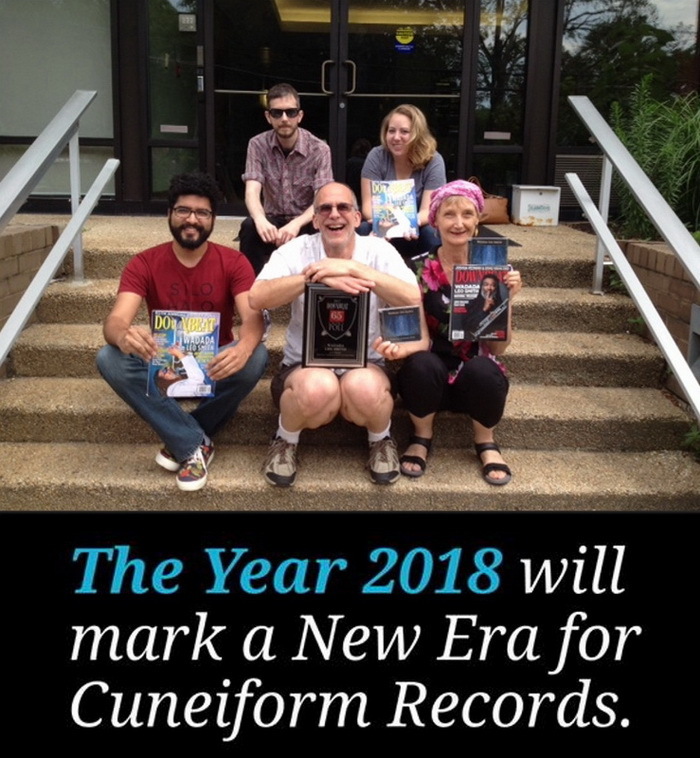 I am also still here running Cuneiform, including doing administration of the label, handling any sales that comes in, and paying royalties to the artists for all sales. Just as we have for over 3 decades. It's actually exactly 33 1/3rd years (really!) from the date of our first release by R. Stevie Moore to our final release of the Art Zoyd set. I didn't plan it that way, but 33 1/3rd years does somehow seem beautifully appropriate. If you like what Cuneiform does, and there are releases you've been meaning to buy, but just never quite got around to it, and would like to help us by throwing a little coin in our direction, please go here for what you can buy in physical format and please go here for what you can buy in digital format. So, that's that. You can read the full press release here if you're interested in it. Thank you everyone for your interest and support over the decades. Obviously we could not have accomplished so much without your support and this newsletter is the place to be if you want to know any news if there is new news to be known! Once again, thank you; while all this doesn't make me happy, we had a good run thanks to our friends!"